If you are a WordPress blogger using Bluehost hosting, and if you have missed reading my earlier post, click here & read that first. Why you should use PHP 7 over PHP 5.6. How to check which version of PHP your site is running on. How to check if your plugins & WordPress theme are compatible with PHP 7. This tutorial is going to help you improve your WordPress blog performance on Bluehost hosting by a great extent. Check if your existing plugins & theme are compatible with PHP 7. You can follow the process mentioned in the earlier tutorial to do that. Once everything looks OK, let’s go ahead & speed up your WordPress blog with PHP 7. Note: For all new Bluehost WordPress customers, they are adding in PHP 7 by default. If you are still on PHP 5.6, there’s no need to worry as you can either ask Bluehost customer support to upgrade for you, or you can simply follow this tutorial & do it yourself. Again, if you are running more than one WordPress site on your Bluehost hosting account, make sure your check that all the plugins & themes are compatible on all sites. Also note: If something goes wrong, you can always downgrade to PHP 5.6 & everything will be fine. I would also suggest you take a speed test before upgrading to PHP 7 to check the performance improvements. On this page, you have the option to select between various versions of PHP. In my case, it was set to PHP 5.6 by default. 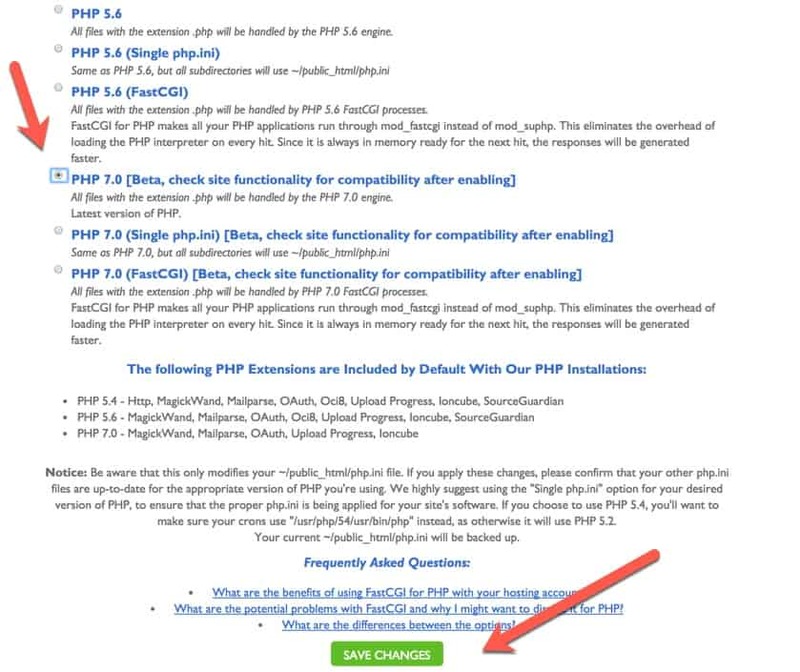 Now select the option that says, “PHP 7.0 [Beta, check site functionality for compatibility after enabling]”. Within seconds, all files on your server with extension .php will be handled by the PHP 7.0 engine. If you are using the display PHP version plugin, simply refresh your WordPress dashboard to see the new version of PHP. That’s it. With a few clicks, your WordPress blog will be running on PHP 7.0, which is way better than PHP 5.6. Many shared hosting companies are now adding support for PHP 7.0 by default. However, if it’s not already set and if you have an option to do it yourself, make sure you get it done. If your hosting doesn’t offer PHP 7.0, Bluehost is a running special promo right now and you can grab Bluehost hosting for a discounted price with the link below. Get Bluehost hosting @ a discounted price. 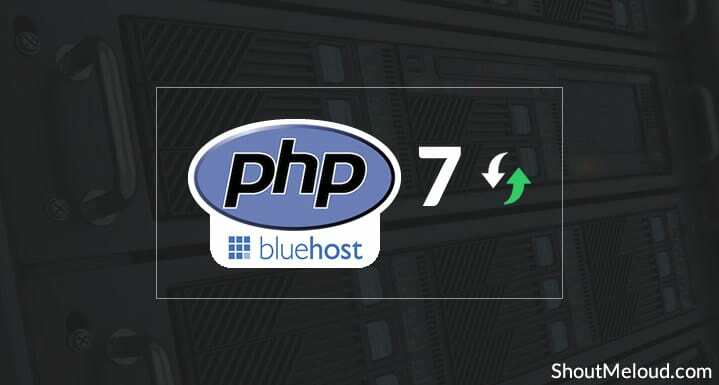 Do let me know what it was like for you upgrading to PHP 7 on Bluehost hosting. Share your experience in the comments below! Also, if you found this guide useful, do share it with others on Facebook & Twitter!